^ a b c Conway, Jill (1966). Blaxland, Gregory (1778–1853) in Australian Dictionary of Biography. Canberra: National Centre of Biography, Australian National University. http://adb.anu.edu.au/biography/blaxland-gregory-1795. ^ Blaxland, Gregory (1823). A journal of a tour of discovery across the Blue Mountains in New South Wales. London: B.J. Holdsworth. Blaxland, Gregory (1823). 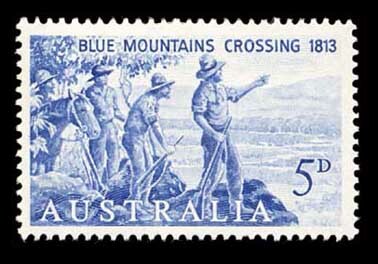 “A journal of a tour of discovery across the Blue Mountains in New South Wales”. （ニューサウスウェールズ州立図書館所蔵） (London, UK). http://acms.sl.nsw.gov.au/album/albumView.aspx?itemID=846609&acmsid=0 2011年9月30日閲覧。. Conway, Jill (1966). “Blaxland, Gregory (1778 - 1853)”. Australian Dictionary of Biography (London, UK: Melbourne University Press) 1: 115-117. http://www.adb.online.anu.edu.au/biogs/A010109b.htm 2011年9月30日閲覧。.